Ready, set, and go and snap up as much of the 2008 The Poplars Coonawarra Autumn Harvest Botrytis Chardonnay while you can. This completely indulgent dessert wine is our South Australian Drink Of The Week for two reasons; it showed great versatility and it is available for only $15 a bottle. This wine can be drunk by itself, with dessert, with a cheeseboard, or, as happened with us, with an array of Vietnamese dishes, all without missing a beat. But the price. This 10 year old Botrytis Chardonnay is only $15 a bottle or, when you buy a case for $120, is only $10. That is a tiny price to pay for this late harvest drop that is so perfectly balanced. 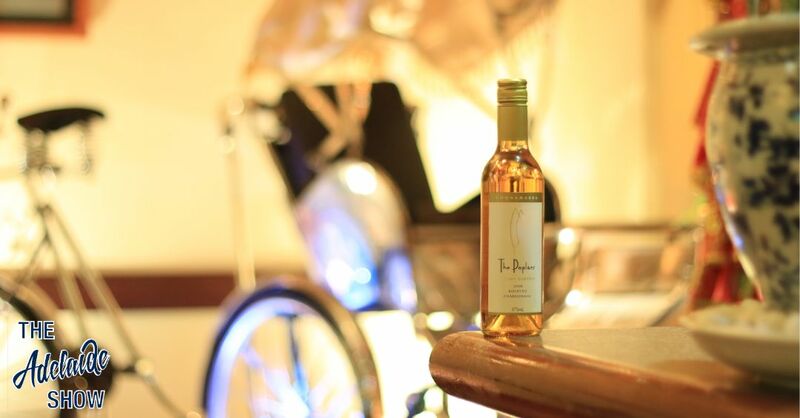 You can by it directly from the producers, here: The Poplars Botrytis Chardonnay. From the winemaker, James Yates: Back in 2008, the fruit was left to hang of the vines until the very end of harvesting with picking occurring in May. This extended time on the vine allowed for the noble rot to set in and concentrate the sugar in the berries to a high level. The fruit was then hand picked and whole bunch pressed, before undergoing cold fermentation. The first thing that will strike you about this wine is just how beautiful it is to behold. It has a clean, pure, bold golden hue that sits proudly in the bottle. Nigel demolished his glass within seconds and was impressed by how refreshing this Botrytis-style wine was, compared to others which are typically stickier and sweeter. Steve noted that it is a sweet, refined drop that will lead to a happy ending for any meal BUT could be easily sipped cool during warm evenings. Kim Le said it reminded him of sitting in a Vietnamese restaurant in Vietnam, sitting on a plastic stool sipping young coconut juice with a hint of star anise. Steve replied by saying this wine is like sitting in a reclining chair on a warm summer’s day when all you need is a gentle fan blowing on you to have all the elements balanced perfectly, perhaps with some floral and tropical scents wafting in on the occasional breeze. This wine just sits beautifully on the palate and ends with a clean finish. It was a great, great pity to have finished the bottle. You can hear our live tasting of the 2008 The Poplars Coonawarra Autumn Harvest Botrytis Chardonnay at the beginning of episode 259 of The Adelaide Show Podcast in the player below or by downloading it onto your smartphone or tablet by searching for our show in your favourite podcast app.